The project will develop girls and women's capacity to use the XO laptop to empower their organization's initiatives and learning. We plan to develop a curriculum on the laptops to educate the girls in basic media, writing, research, publicity, photo and video use. They will use publishing and research tools to develop, education about micro-credit, and girls and women's health issues. They will learn how to use the internet to advance the causes of their organization and of their own entrepreneurship. Goals include website development, archiving and publishing of the life stories of some of the girls and women of the community, using digital photography for website development and advertising of products produced by the girls and women, including honey, soap, clothing that they sew, baskets that they make, among others. Computer training, curriculum development for the training of girls and women in the various activities of Aiki Yanke Talauci, developing of marketing strategies, research and development of secondary products to the artisanry produced by the girls and women, archive development. In this traditionally Islamic West African community, Hadja Aminata Djima serves a constituency which meets every week with 50 girls and women who have been traditionally disenfranchised due to the lack of access to education and to other sources of knowledge that would enhance their ability to have careers and be economically autonomous in the society. The laptops will also enable the girls and women to increase their reach within this traditional community in the Route de Filingué quartier of Niamey, Republic of Niger. El-Hadj Abdoulkader Yazi Dogo was born in the Republic of Niger during the 1940s. He went through the French language primary school and secondary school in pre-independence Niger, and went on to become an educator in the early part of his career, and later moved up through the hierarchy in education. He was one of the first primary teachers to teach the new Hausa curriculum that was introduced into the public school system in the 1970s. During a visit to Niger in 1974, I was fortunate to visit his school and to be introduced to the methodology that was adopted in an environment where French had always been the exclusive medium of instruction. This was a pioneering effort that led to the introduction of Nigerien languages into schools throughout the country. Please visit the African Language Materials Archive website to see video of El-Hadj Yazi Dogo and much more information. Aiki Yanke Talauci is a Nigerien NGO which works to help women and girls to fight against poverty and marginalization in a very challenging environment. It was created by Hadja Aminata Djima (Mme. 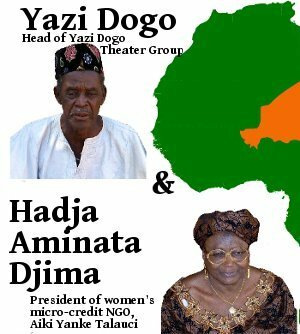 Yazi Dogo) in 2003 as a micro-finance group. A group of women living in the quartier of the Filingué Road in Niamey, Niger took the initiative together with her. Since it was established, the women and girls meet every week at the home of Hadja and Yazi to combine and share their resources. They are known also as the Groupement Cheto and they belong to MECREF, the umbrella organization for girls and women's saving and credit. The original groupement was converted into an official NGO by Madame Aminata in 2005 and renamed as Aiki Yanke Talauci, Hausa for "Working to reduce poverty"q. Madame Aminata has led this group beyond just the micro-credit activities toward a full curriculum of development-related training and awareness. The women and girls are trained and made aware of the health challenges and risks to their role in their society, including: AIDS, malaria, polio, early marriage, and prostitution. They also offer training in various cottage industries and manufacturing including soapmaking, porridge fabrication from yoghurt & millet, sewing, etc., among many others. Women are empowered through the opportunity to use their loans to produce products and sell them locally. In collaboration with Hadja Aminata Djima and the members of Aiki Yanke Talauci, Boston University student Emily Nolan was able to record video interviews with 10 members of Aiki Yanke Talauci who were enthusiastic about talking about their experience in the organization, and how they have connected with the process of micro-credit lending. In this 1 hour video, all 10 of these women speak in their own language about their experience. The subjects appear in the video in the same order as shown in the Women of Aiki Yanke Talauci section. See the Women of Aiki Yanke Talauci Video.